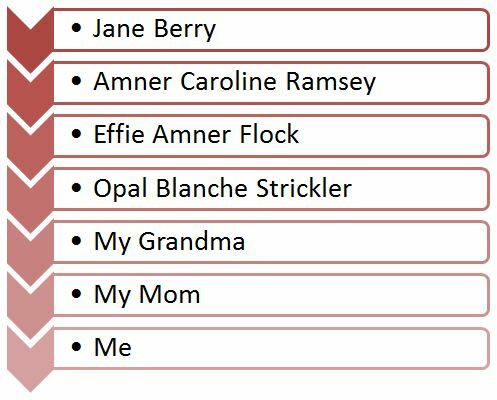 A couple of weeks ago I wrote about finding Caroline Flock in the Enid City Directories at Ancestry.com. At the time, Caroline was living with her second daughter, Addie Tharp. I have since done some research into Addie and her life. I was amazed how much I was able to find in a short amount of time about my great-great-grand aunt. Addie was born Adeline Martha Flock November 5, 1863 in Iowa. She is enumerated with her parents as Martha in the 1870 and 1880 federal census. The 1875 Kansas census lists her as “A.” She is then listed as Addie in the 1885 Kansas census. 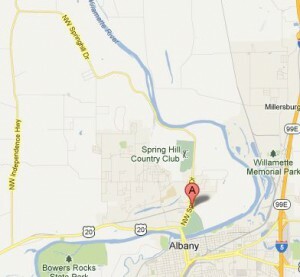 I have not found out the exact date but at some point Addie moved to Oregon in the late 1890’s. I have found the 1900 Federal Census record for Addie’s brother, Pearl. His son, John F., was born in Oregon in 1899. It is a very possible that Addie traveled to Oregon with Pearl and his wife, Mary. 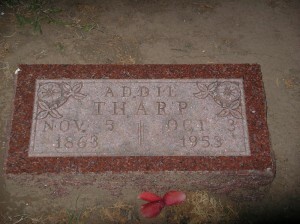 Addie married Frank Tharp December 19, 1897 in Albany, Benton, Oregon. 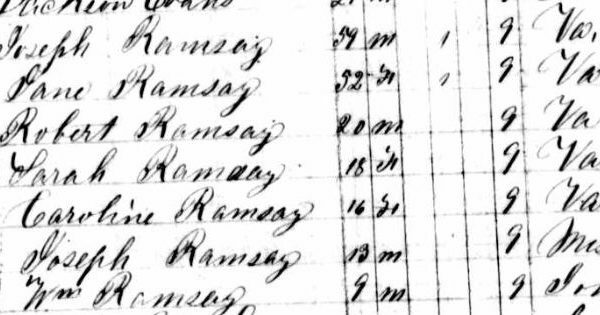 The 1900 Federal Census finds Frank and Addie living in Fairmont Precinct, Benton, Oregon with Frank’s two daughters from a previous marriage. I believe from a photo I found on Ancestry.com of the family that Addie is Frank’s third wife. Frank and Addie farmed in the same area for some time. They are found again in the Fairmount Precinct in the 1910 and 1920 census. In the picture below, the enumeration district is pretty much everything west of the Willamette River. It is just north of Corvallis, Oregon. 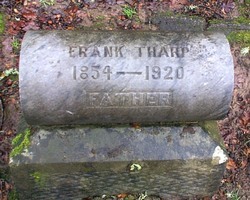 Addie and Frank were married for 23 years when Frank passed away on March 1, 1920 in Albany, Linn, Oregon. He was buried in the cemetery there. Addie is next found living with her mother in Oklahoma in the 1926 Enid City Directory. I do not know how soon after Frank’s death that she moved East. It must have been a very different trip traveling to Oklahoma in the 1920’s then traveling to Oregon thirty years earlier. Addie stayed in Enid, Oklahoma after her mother’s death. She passed away October 3, 1953 and was buried in the same cemetery as her mother. Matthias Flock is my 4th great grandfather. 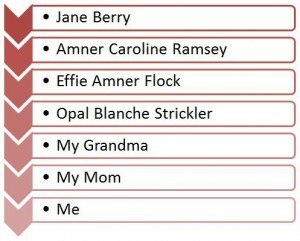 (me->my mom->Roberta Mitchell->Opal Strickler->Effie Flock->John Flock->Matthias Flock). He was born about 1813 in New Jersey. He died between 1860-1870 in either Appanoose County, Iowa or York County, Nebraska. He married Margaret Fankboner in 1835 in Tuscarawas, Ohio. I have documented 11 children born between 1835 and 1860. Using the information I had gathered in the excel sheet, I created a google map to get a better visual idea of how the Flock family moved around the United States. First they moved west, then South. 1865?- 1878? – Margaret now a widow, lives in York County, Nebraska. One of her son’s remainded behind in Iowa and did not make this move. 1878-1884? – Margaret moves in with son John and his family in Washington County, Kansas. She has left another couple of sons in York, Iowa. 1884- 1904 – Margaret is no longer living with John. She is found again in 1904 in the Cemetery in Ringwood, Oklahoma. One of her sons, Charles, is also buried there with his family. It is possible that she lived her last years in Oklahoma with him. An interesting note is that another son, John, died in Enid, Oklahoma. Enid and Ringwood are only 21 miles apart. For this family, that is a small distance. When my ancestors moved in the mid and late 1800’s, they were definitely part of America’s great Western Expansion. I took a look at the BLM website to search for any land patents. I was amazed to see that most of Matthias and Margaret’s sons applied for patents in Iowa, Nebraska, and Oklahoma. I will have to spend some time learning more about the Homestead Act of 1862 and my ancestors roll in populating the west.